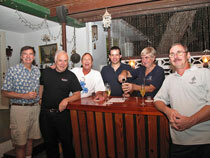 John (W6LD) and Andy (AE6Y) are the co-owners of the cottage. 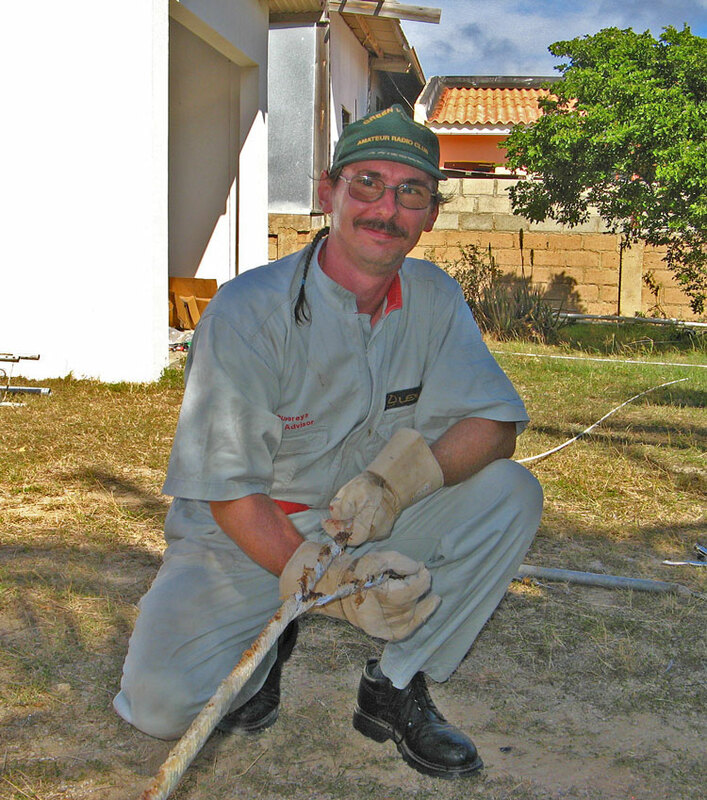 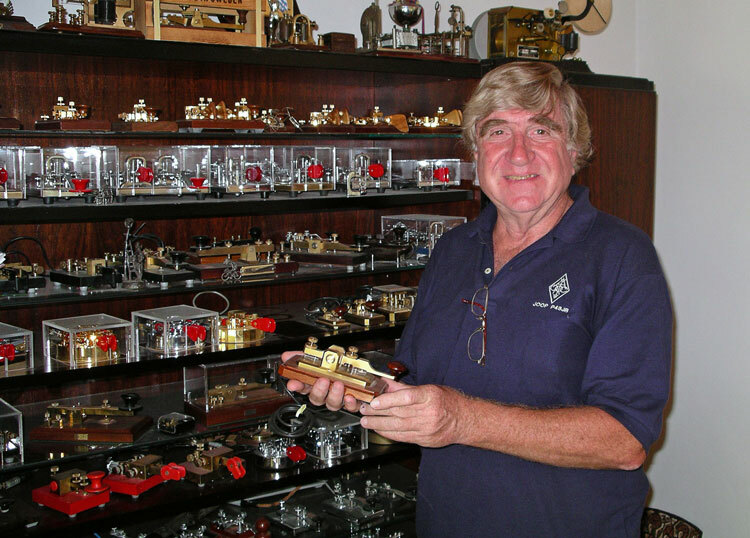 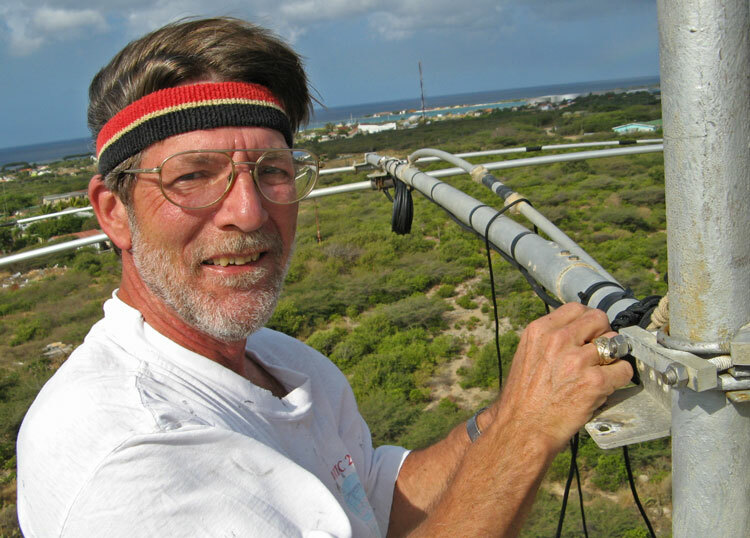 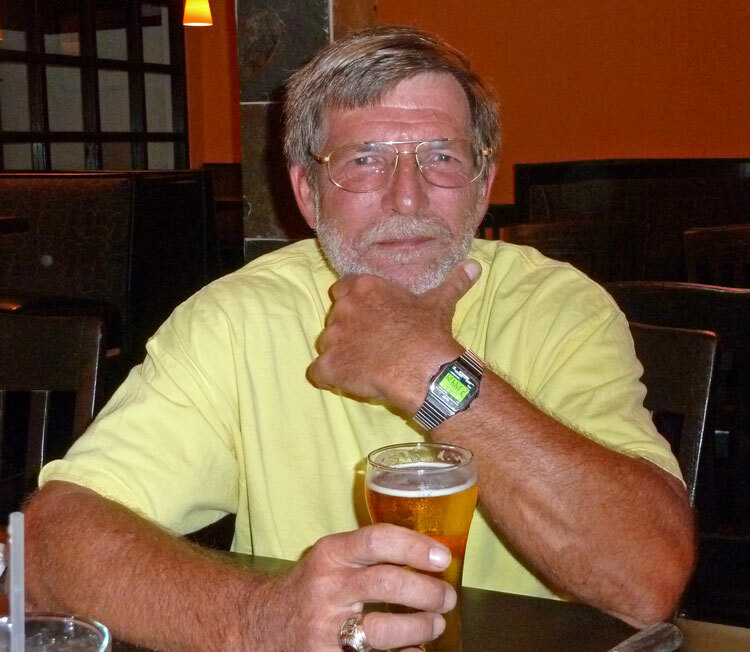 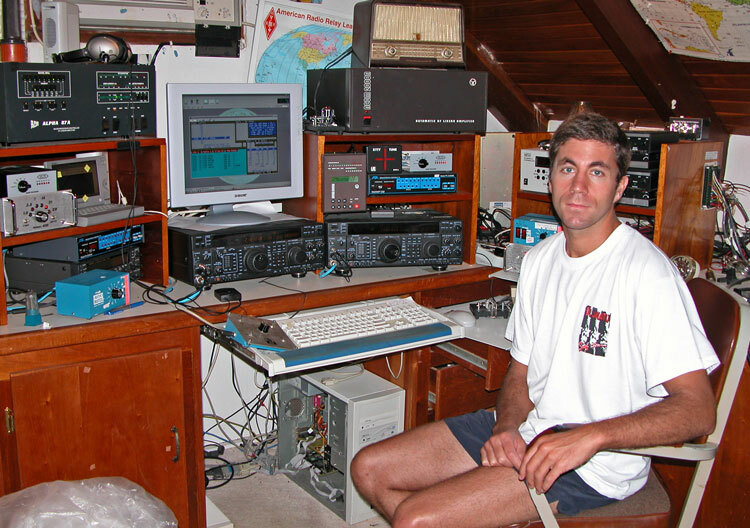 (W0YK) Ed has turned into a world leader in RTTY contesting from the cottage, and also has participated in CW contests, and was our chief tower climber in the 2008 antenna refit party. 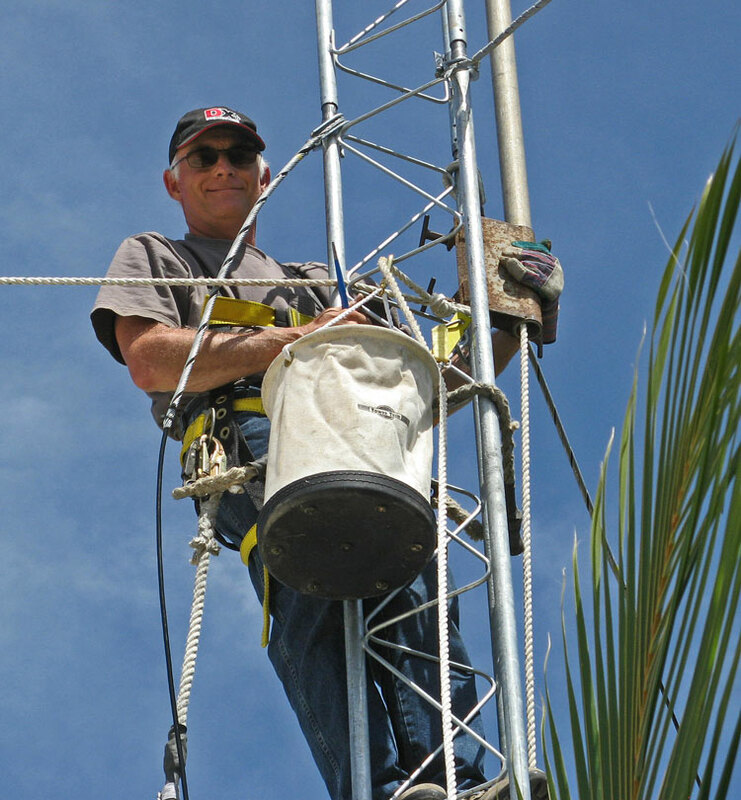 Dismantling tower A retired HP engineer, he now is a master vintner and winemaker. 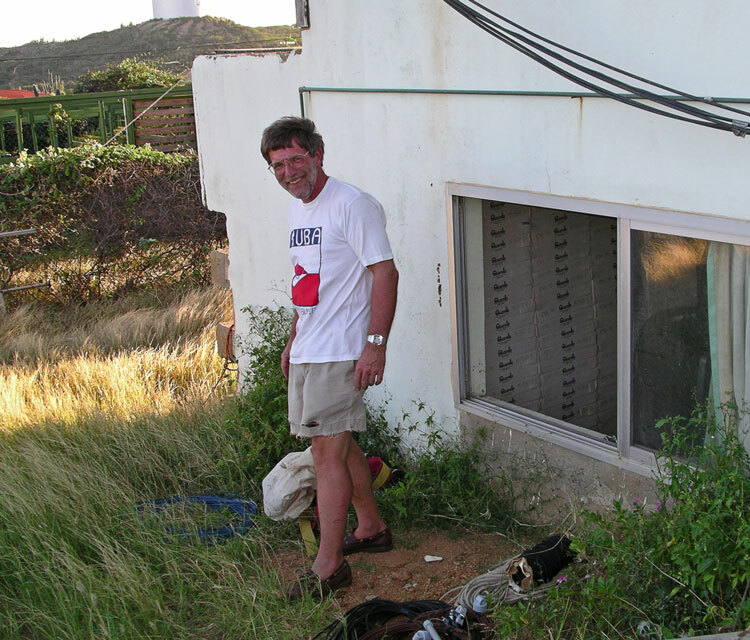 Check out Muns Vineyard. 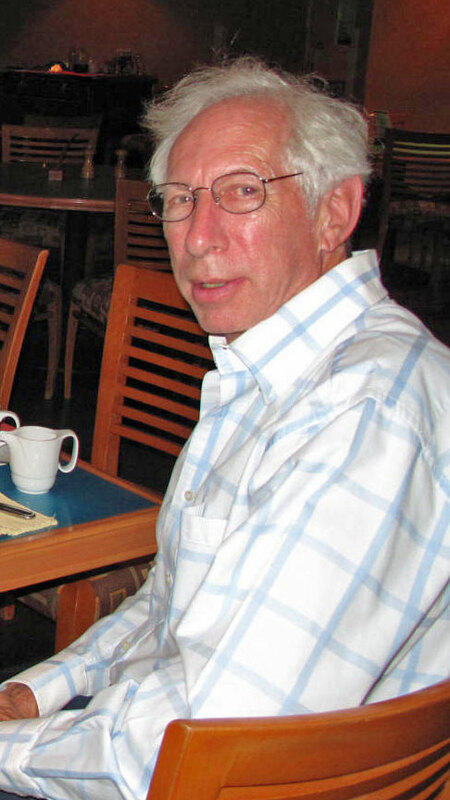 Here's more info on Ed. 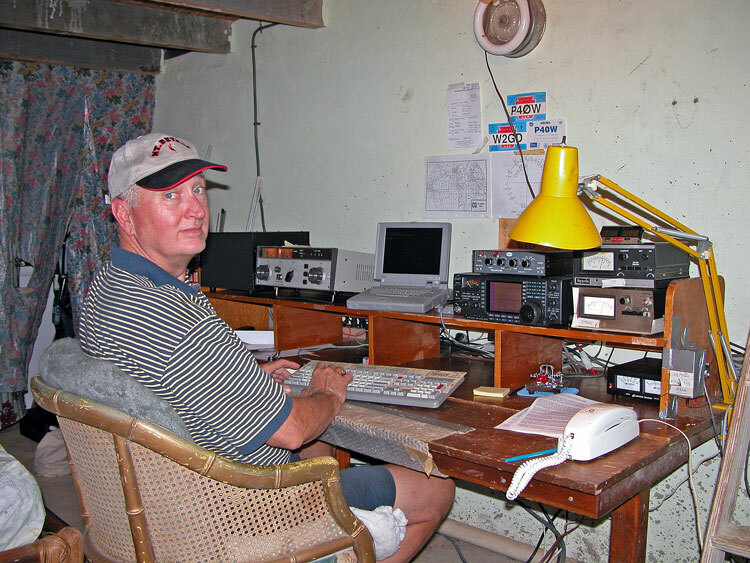 AI6V, also P49V, developed our station, and then another one on Aruba along with wife Sue , P40YL. 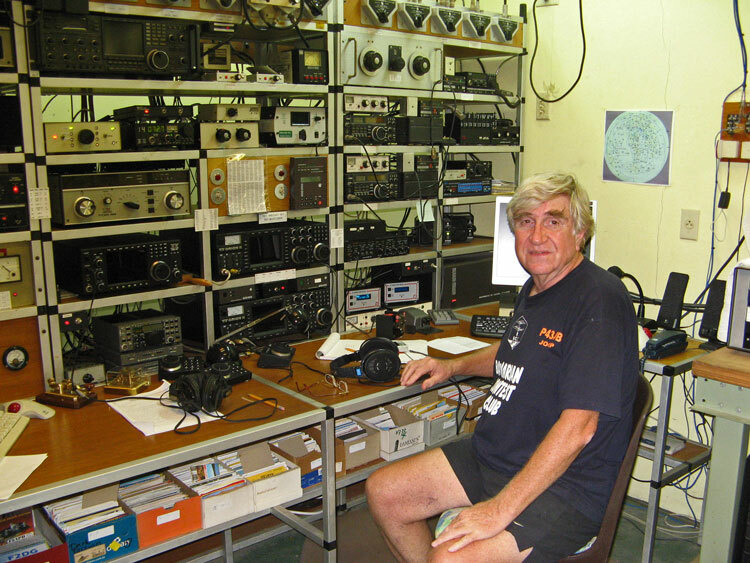 The second station is now owned by Ben, DL6RAI, rental info. 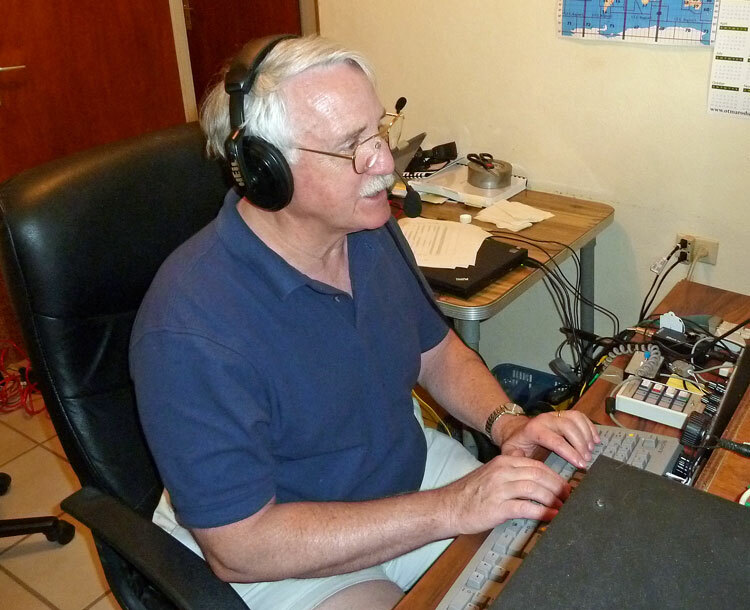 Temporarily inactive, Jackie has posted many top scores from his north-shore QTH and hosted world class contesters like CT1BOH and I2UIY (SK). 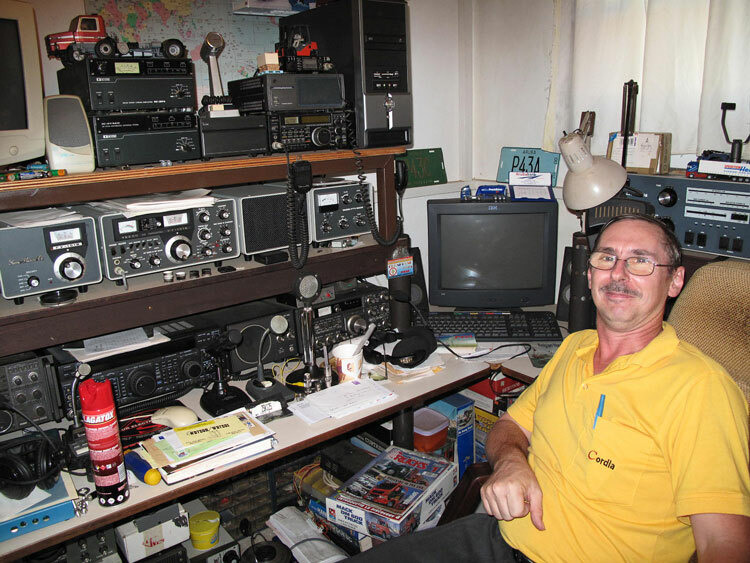 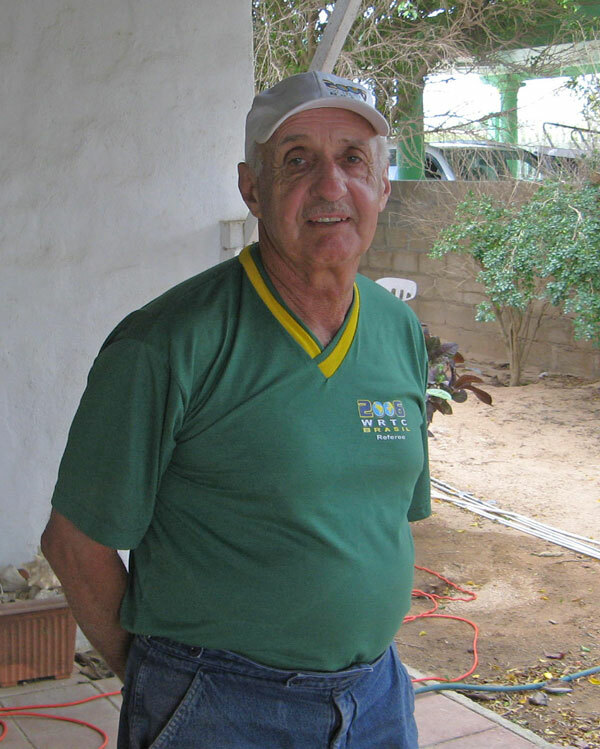 (KK9A) Winner of many events, mostly low power, unfortunately John has sold his house at Tierra del Sol and dismantled his station. 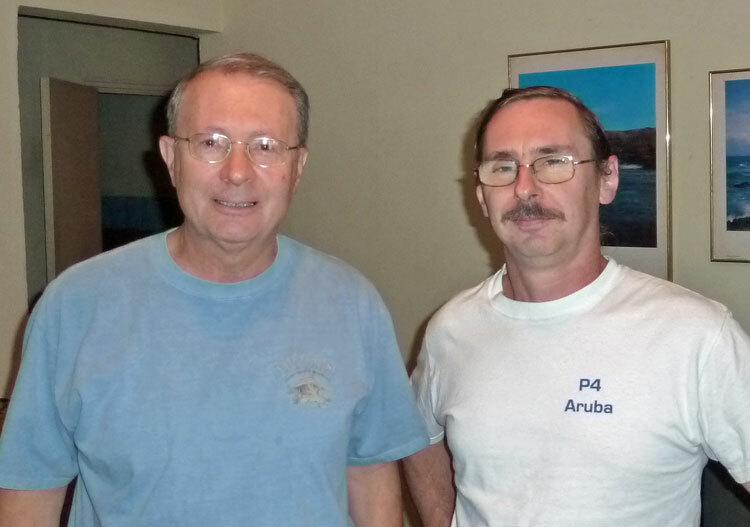 John and Andy in O'stad. 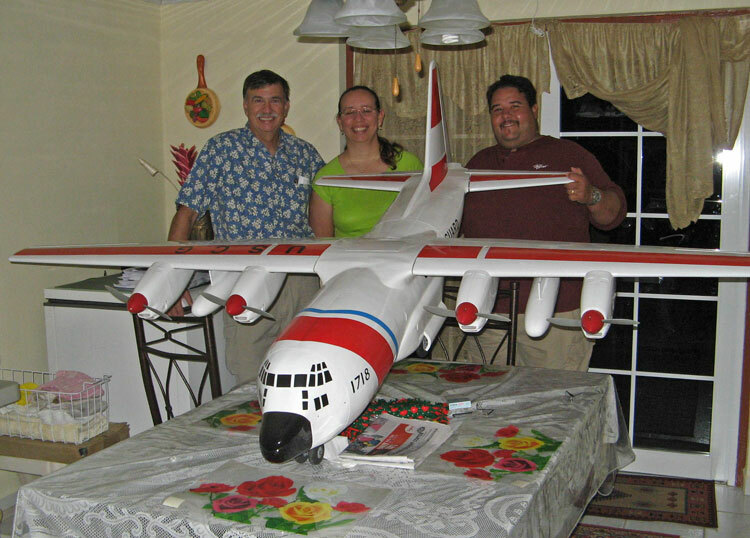 (K6TA) Ken and XYL Kay often come down in December. 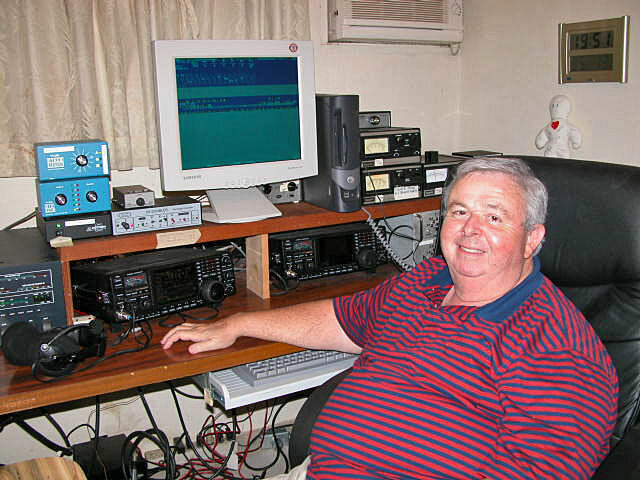 Ken specializes in the ARRL 160m Contest. 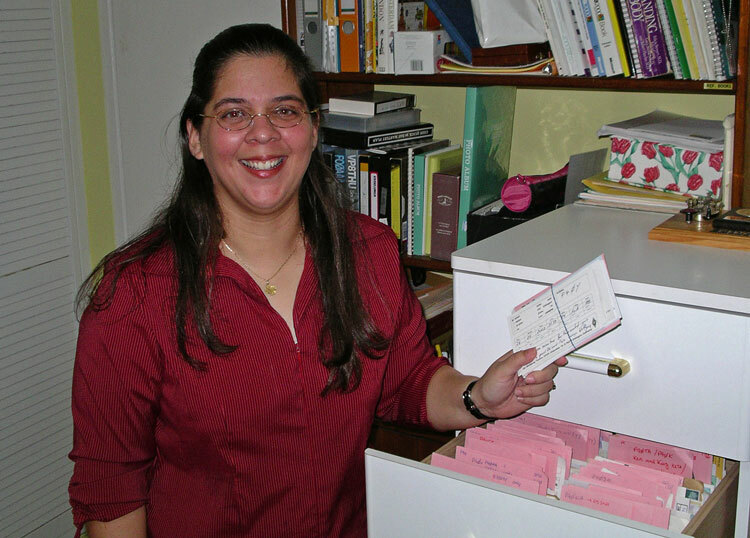 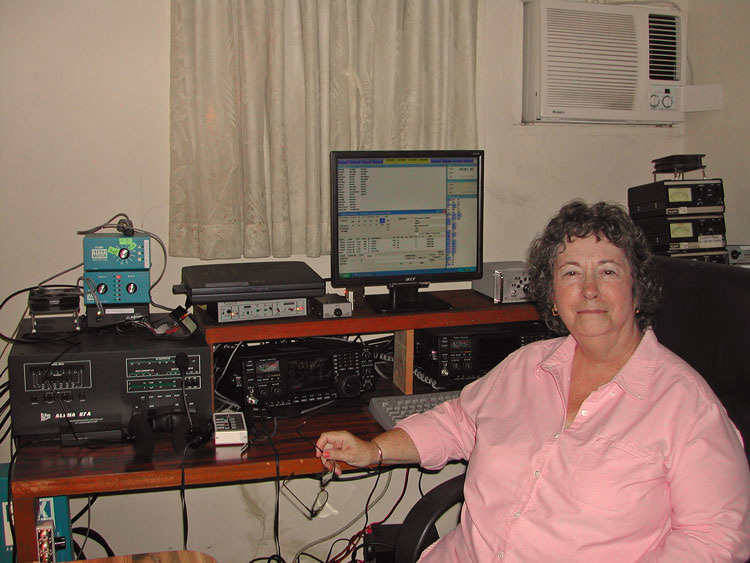 (K6KO) Ken's better half, Kay prefers the ARRL 10m Contest. 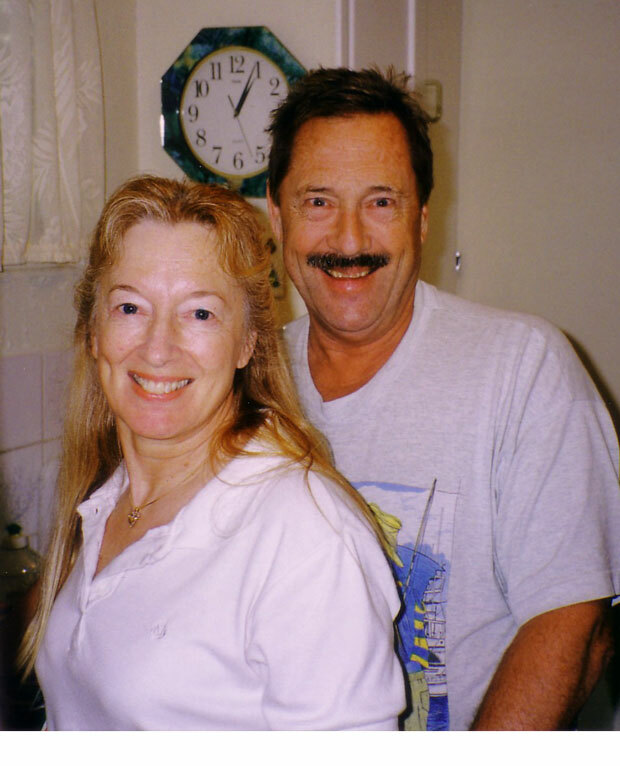 She usually leaves behind a jar of Amador County Fair prize-winning preserves! 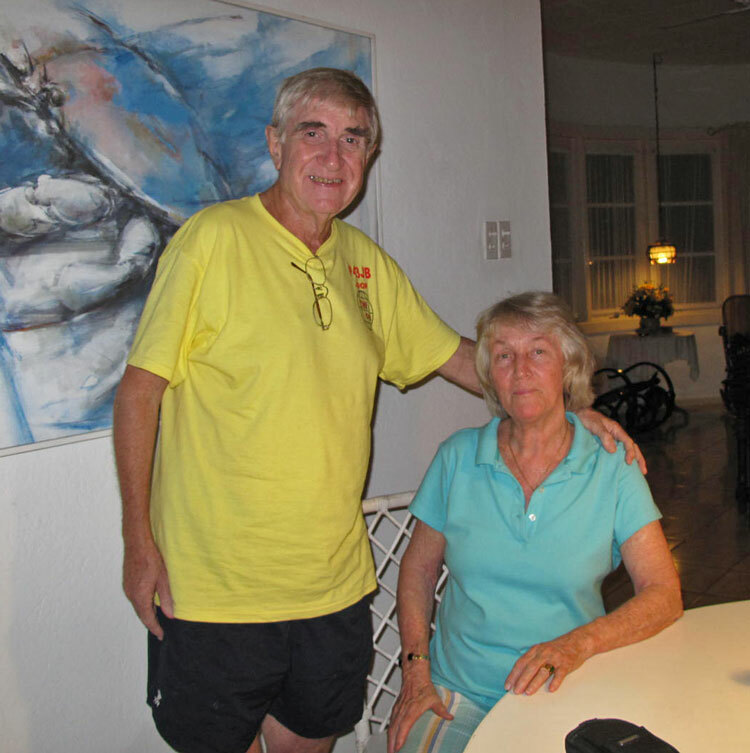 (VE3MR) Martin and XYL Truus (P49MRS) hand out winter-time contacts from the beach at Malmok. 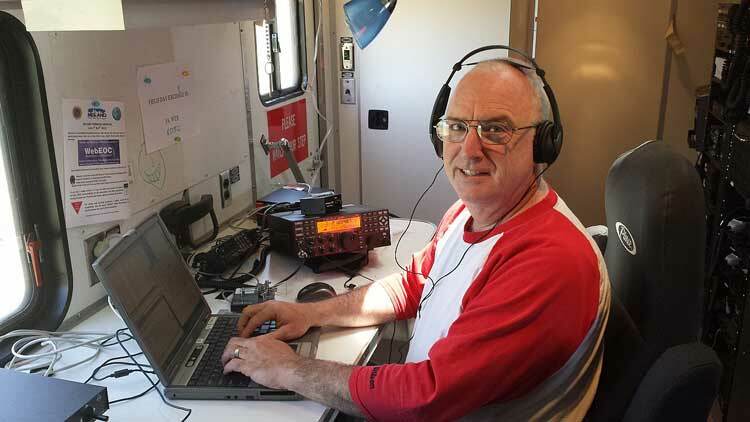 (DL4MM) Mat has enjoyed great success operating the station in the CQ 160 CW Contest. 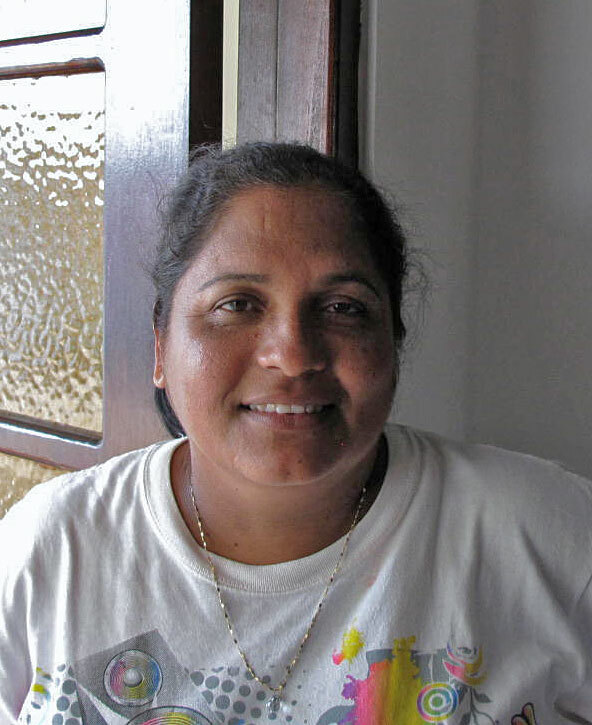 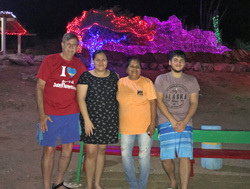 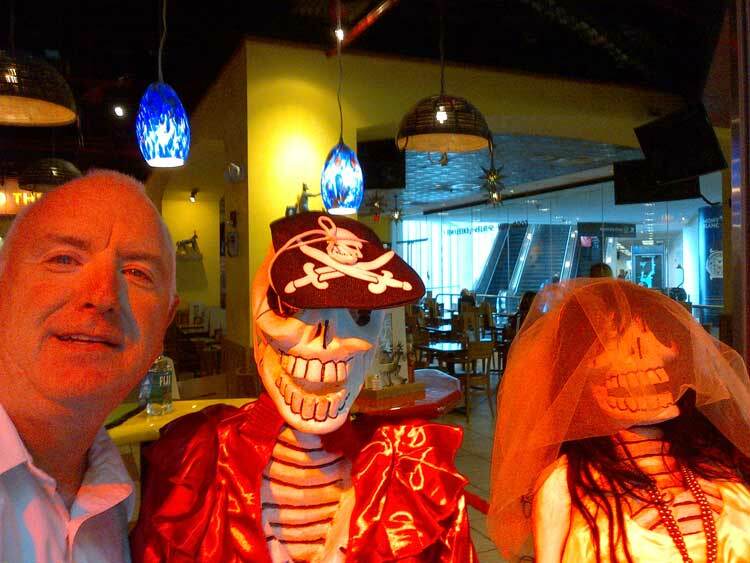 One of the delightful aspects of visiting the island is the getting to spend time with a number of really interesting and friendly people, both visitors and Aruba residents. 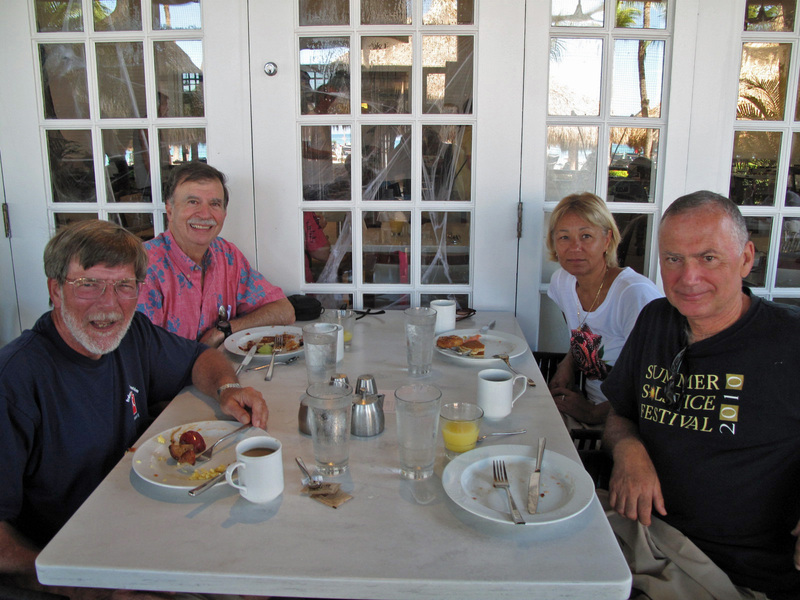 Here are some pictures showing some of our island friends. 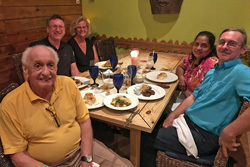 A tradition that may be unique to the Aruban contest community is the "post-contest dinner," generally occurring Sunday evening after each major contest. 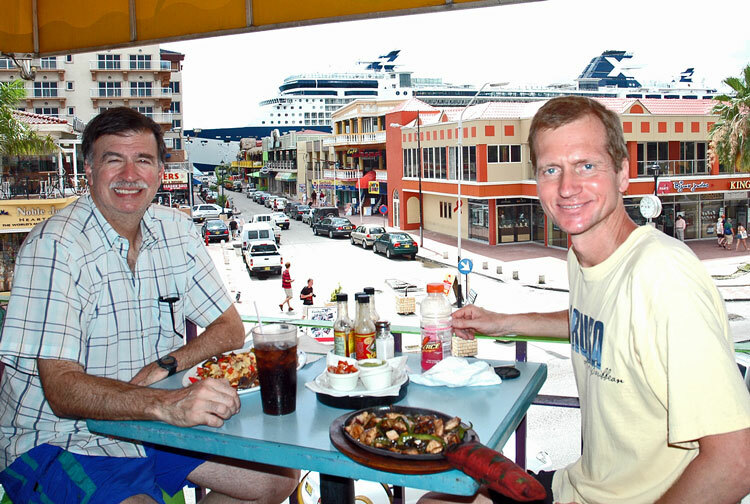 When we first started contesting there in 2003, the traditional watering hole was Brisas del Mar ("Breezy's" as AI6V called it) at Savaneta, but many other resaurants have been enjoyed, including Tony Roma's (W2GD's perennial favorite), Texas de Brasil, Don Carlos on the Wharf, Joop's (P43JB) and Yvonne's most excellent private Heineken-serving patio in Oranjestad, and other local eateries. Here are some pictures of the local community, some of which were taken at various post-contest festivities. 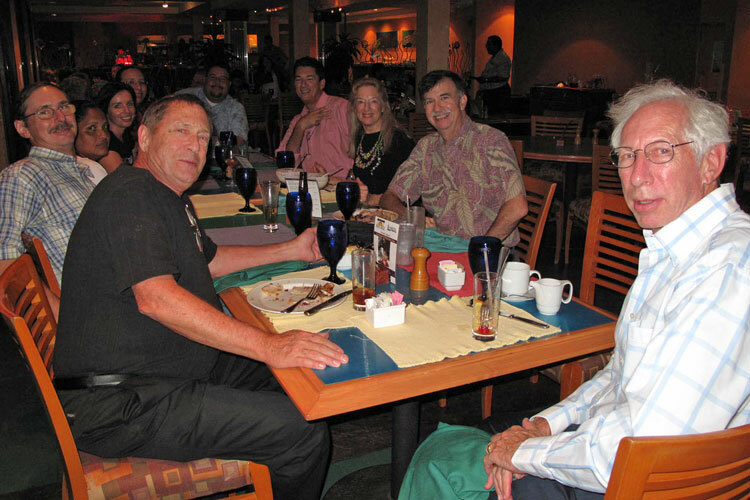 Click on any picture to enlarge, and note that the ID's all go left to right. 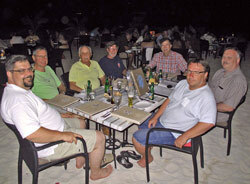 2010 WPX SSB post-contest dinner chez Joop and Yvonne: Andy, Russ (K6KLY), Carl (P40V), Stefan (DK1MM), Joop (P43JB), JP (P43A). 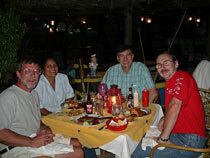 2008 WPX CW at the cottage: Denny (KX7M), Ed (W0YK), John, Lisandro (P43L), Lissette (P43L XYL). 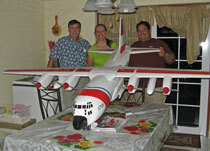 2008 Andy, Lissette and Lisandro with the largest R/C plane on Aruba, Lisandro's C-130. 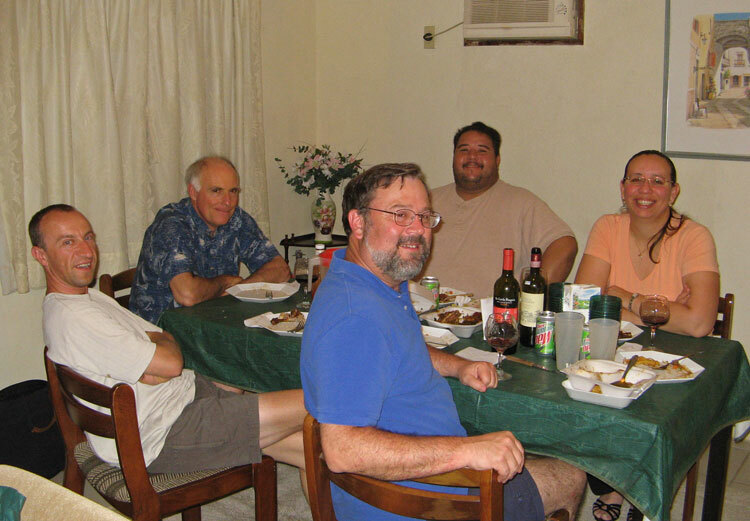 Dinner at JP's and Chris's: JP (P43A), Chris (P43C) & Andy, Cindy, Sue (P40YL), Andy, Carl (P40V). 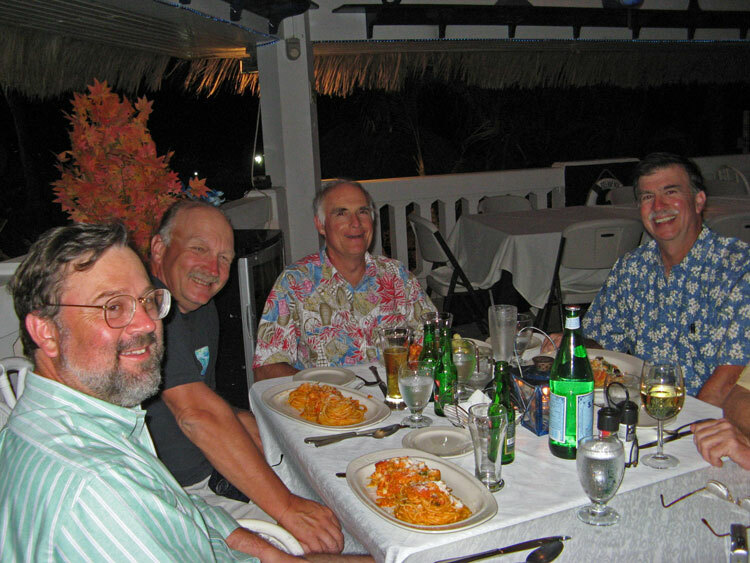 Feb. 2008 Dinner at La Granja during the antenna work party: John, Tom (N6BT), Ed (W0YK), Andy. 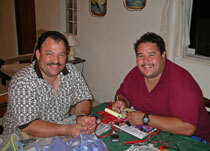 Raul (P43RC) and Lisandro (P43L) working at the kitchen table. 2009 Thanksgiving: JP (P43A), Chris (P43C), Katrine, Lissette,Carl (P40V), Lisandro (P43L), Jackie (P43P), Sue (P40YL), Andy, Martin (P49MR). 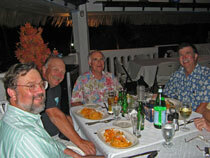 Feb. 2004 Dinner at Marina Pirata: John (W2GD), Chris (P43C), Andy (AE6Y), JP (P43A). 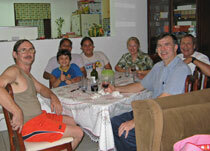 Feb. 2004 Post-Contest Dinner at TR's: Andy, John (W2GD), Jackie (P43P), Lisandro (P43L), Paolo (I2UIY -SK), Emily (P43E). 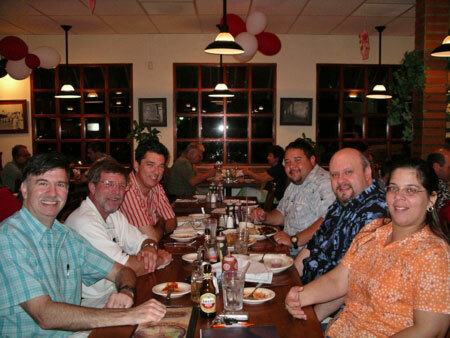 Same Table, 6 years later. 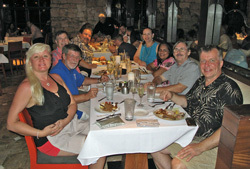 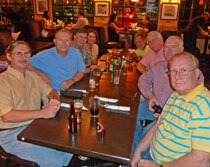 Oct 2010: JP, Ed (N4OC), Andy, Donna (XYL-K0DQ), John (W2GD), Scott (K0DQ), Robert (W5AJ), Bill (KE5OG). 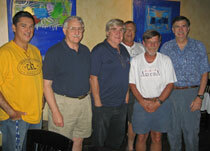 Nov. 2008 post-contest dinner, looking like a police lineup. 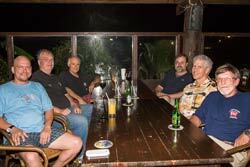 The "usual suspects" are Jackie (P43P), Scott (K0DQ), Joop (P43JB), Carl (AI6V), John (W2GD), Andy. 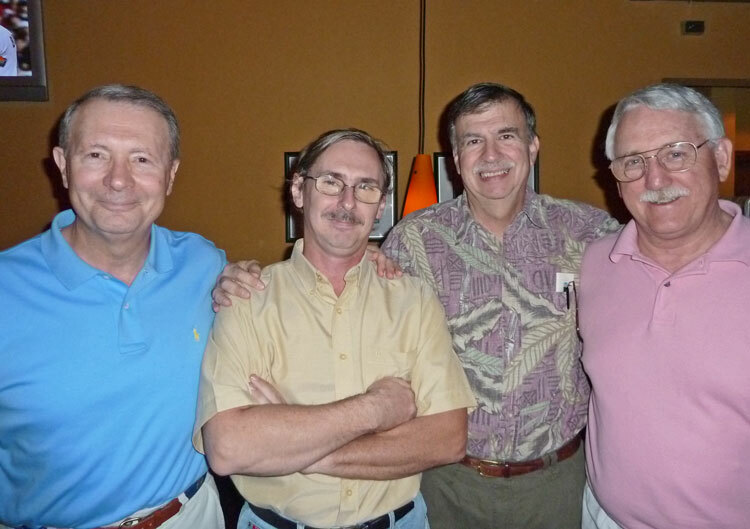 Oct. 2010 CQWW SSB Team: Ed (N4OC), JP (P43A), Andy, Scott (K0DQ). Nov. 2013 CQWW CW: Val (P40F, R5GA), Steve (K6AW), Ed (W0YK), John, Mike (N7MH), John (W2GD). 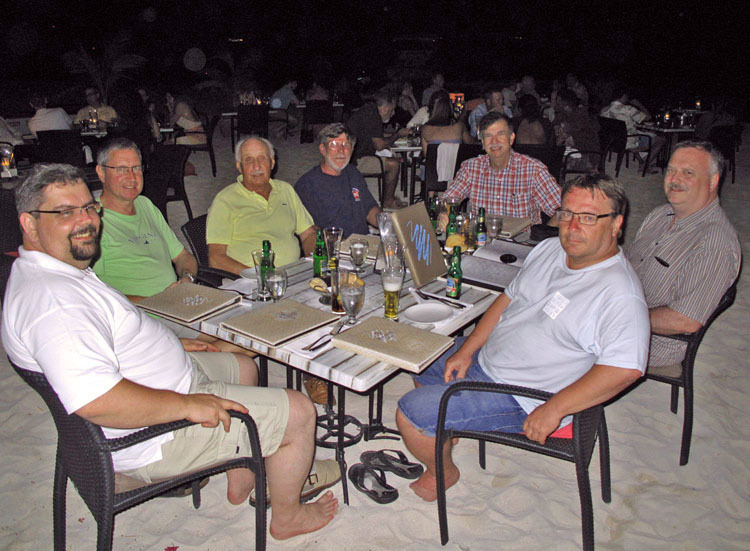 Feb. 2016 ARRL DX CW: Olli (DH8BQA), Ben (DL6RAI), Andy (K2LE), John (W2GD), Andy, Tom (DL5LYM), Paul (DL5CW) at Barefoot on the beach. Nov. 2016 CQWW DX CW: Thanksgiving at the Hyatt: Natasha, John (W2GD), Andy, Lisandro (P43L), Lissette, Cris (P43C), JP (P43A), Alex (KU1CW). Feb. 2017 CQWW 160 CW: Andy (K2LE), Mat (DL4MM), Sabine, Cris (P43C), JP (P43A) celebrate Mat's fine effort. Oct. 2017 CQWW SSB: Post-Contest Breakfast: John (W2GD, P40W), Andy, Anta, Yuri (VE3DZ, P40T). 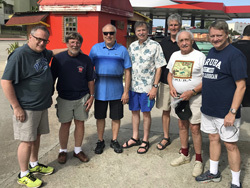 Oct. 2018 ARRL DX CW: Post-Contest Breakfast: Art (N3DXX), John (W2GD, P40W), Ray (K9RS), Andy, Bruce (AA5B), Andy (K2LE, P40LE), Steve (AA7V). 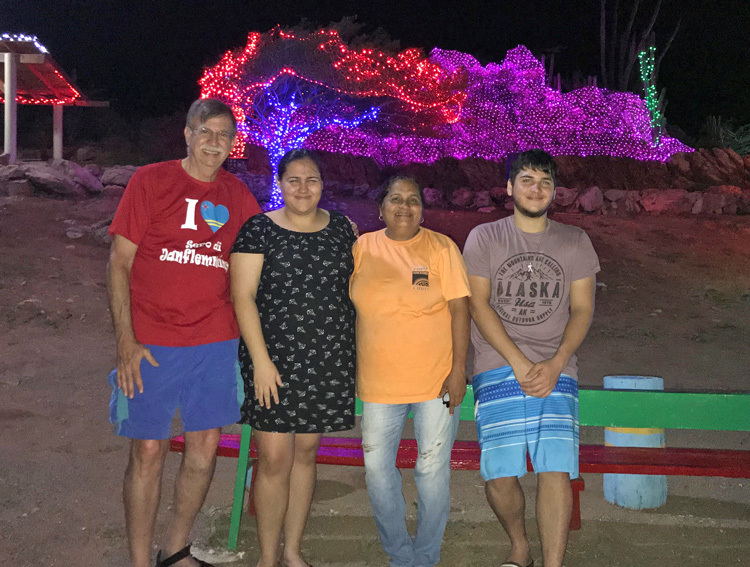 Oct. 2018 November: Andy with Cindy, Cris, and Andy Lauweries at community Sero di Jan Flemming Holiday Site.